Neuronal activity controls the synthesis and secretion of neurotrophins during critical periods (CPs) of synaptic development and remodeling1-3. Cumulative evidence suggests that neurotrophins regulate structure and function of synapses, both pre- and postsynaptically4-6. These results make neurotrophins particularly attractive candidates as regulators of synaptogenesis. Nevertheless, studies of neurotrophic regulation of synaptogenesis are still at a descriptive stage, and relatively little is known about the underlying mechanisms or functional significance in living animals. 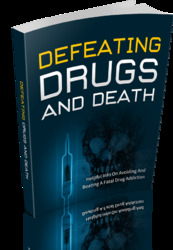 This is due largely to the ever-changing landscape of research in neurotrophin signaling. Novel interacting proteins and new signaling cascades are continuously being discovered. Thus, it is important to update the current understanding of neurotrophin signaling (Figure 12.1). A general scheme (Figure 12.1A), largely based on studies of NGF and TrkA in PC12 cells, in that binding of neurotrophins to their cognate Trk receptors causes receptor dimerization and phosphorylation of tyrosine residues in their intracellular domains (ICDs)7,8. Phosphorylation of these tyrosines creates docking sites for several adaptor proteins, which in turn activate three key signaling pathways (Figure 12.1 A): the PLC-y, Ras-Erk/MAPK, and PI3K/Akt cascades9,10. Active PLC-y hydrolyzes phosphatidylinositol 4,5-biphosphate [PI(4,5)P2] to generate inositol trisphosphate (IP3) and diacylglycerol (DAG), which in turn induces Ca2+ release from internal stores and activates protein kinase C, respectively. Activation of Shc, through interaction with Grb2 and SOS, triggers a series of phosphorylation reactions that include Raf, MEK, and mitogen-associated protein kinase (MAP kinase). Through Gab-1, Shc also activates phosphoinositide 3-kinase (PI3 kinase). Figure 12.1. 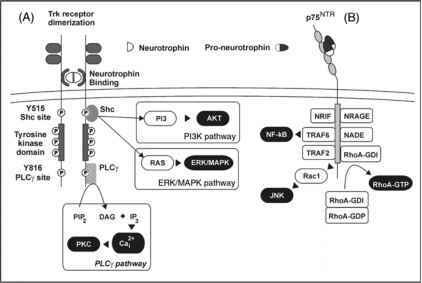 Neurotrophin Signaling Through Trk and p75NTR Receptors. (A) Homodimeric neurotrophins (NGF, BDNF, NT-3, NT4/5) induces the dimerization of their cognate Trk tyrosine kinase receptors. Autophosphorylation of tyrosine residues in the kinase domain primes subsequent phosphorylation events at other tyrosine residues, Y515 and Y816, and creates binding sites for Shc and PLCy, respectively. As a result, three major signaling cascades can be activated: PI3K pathway, ERK/MAPK pathway, and PLCy pathway. (B) Pro-neurotrophins and to a lesser extent mature neurotrophins bind p75NTR receptors. Upon activation, a signaling complex that includes NRAGE, NRIF, NADE, and TRAF can be assembled and induce Rac1 and consequent JNK activation. In a different context, p75NTR can also mediate RhoA activation. Rho-GDI is associated with inactive Rho-GDP, however, ligand binding to a receptor complex, consisting of p75NTR and NogoR and LINGO-1, induces a conformational shift that allows Rho-GDI to bind to the intracellular domain of p75NTR and releases RhoA. Once released, RhoA can exchange GDP to GTP and achieve its active conformation. Although this general scheme is well accepted, each Trk receptor may trigger a unique set of signaling events. Thus, signaling pathways involved in specific synaptic functions in specific brain regions remain to be worked out. For example, acute potentiation of synaptic transmission at the developing NMJ is mediated by concomitant activation of PLC-y-IP3 and PI3 kinase pathways, but not MAP kinase pathway11. In sympathetic neurons, activation of TrkA by NGF stimulates cell survival predominantly through the PI3 kinase pathway, whereas BDNF suppresses apoptosis through TrkB activation of both MAP kinase and PI3 kinase pathways12. Moreover, there are many ways that neurotrophin signal transduction is regulated. TrkA activated at the axonal terminals, through endocytosis of NGF-TrkA complex and retrograde transport of signaling endosomes, can induce MAP kinase Erk5 activation13. In contrast, direct stimulation of TrkA on the cell soma activates Erk1/2, but not Erk5. Signal transduction mechanisms induced by acute or long-term exposure of neurotrophins are dramatically different5. Acute effects of neurotrophins depend on a transient activation of the Ras-MAP kinase and PI3 kinase but not its downstream effector Akt. Long-term effects of neurotrophins appear to be mediated by endocytosis of Trk receptors and sustained activation of Rap1-MAP kinase as well as PI3 kinase-Akt. For synaptogenesis, the most important and relevant attribute of neurotrophin signaling is the activity-dependent regulation of Trk receptors14. Recent studies demonstrated that neuronal activity facilitates the insertion of TrkB onto the cell surface15,16, and also promotes the endocytosis of BDNF-TrkB complexes17. BDNF is secreted from active synapses and neurons recruit TrkB from extrasynaptic sites into lipid rafts, microdomains of membrane that are enriched at synapses18. Postsynaptic rises in cAMP concentrations facilitate translocation of TrkB into the postsynaptic density19. Futures studies are required to dissect the molecular cascades involved in each individual step of synapse formation and maintenance and also identify which critical steps are regulated by neurotrophins. All neurotrophins are capable of binding to the pan-neurotrophin receptor (p75NTR). It has now been widely accepted that prime ligands for p75NTR are not the mature form but rather the unprocessed, pro-neurotrophins20. Recent studies support a "yin-yang" hypothesis that interaction of pro-neurotrophins with p75NTR often elicits biological effects opposite to those elicited by mature neurotrophin-Trk interactions21. While p75NTR facilitates Trk-mediated cell survival in certain cases, a major function of p75NTR, especially when it is expressed alone, is to promote apoptosis22,23. The pro-apoptotic effect of p75NTR is believed to involve the activation of Rac, a small GTP-binding protein, and the activation of Jun N-terminal kinase (JNK). Proximal events that couple p75NTR and Rac are less clear, but the interaction between p75NTR cytoplasmic domain and several adaptor proteins, including TRAF-6, NRAGE, NADE and NRIF, appears to be important (Figure 12.1B). Another important function of p75NTR is to regulate axonal growth and regeneration, which is primarily mediated by the interaction of p75NTR with RhoA, another small GTP-binding protein (Figure 12.1B). The third and paradoxical role of p75NTR is to facilitate cell survival through TRAF-6 and NF-kB (Figure 12.1B). In addition to the complexities of signaling events associated with p75NTR, two recent advances have dramatically changed the landscape of p75NTR research. First, Nykjaer et al. (2004) discovered that the prodomain of unprocessed neurotrophins binds to the extracellular domain of sortilin, and such binding is required for pro-neurotrophin-induced cell death24. Based on this study, a model was proposed that pro-neurotrophins (e.g., proNGF) simultaneously bind sortilin (via the pro-domain) and p75NTR (via the mature domain). Interaction of the pro-domain and sortilin has also been shown to be important for intracellular trafficking and regulated secretion of proBDNF25 The second major advance is that p75NTR is similar to amyloid precursor protein, Notch and ErB4, in the sense that its extracellular domain can also undergo proteolytic cleavage by a-secretase. This is followed by a second cleavage by y-secretase within the transmembrane domain to generate an ICD, which is translocated to the nucleus. It remains to be established whether the production and translocation of ICD controls gene transcription. Advances in p75NTR research have generally lagged behind that of Trk receptors. This may explain why virtually all functional studies on neurotrophins thus far have concentrated on the effects mediated by Trk receptors. Given the breakthroughs made in the p75NTR signaling in the last few years, we expect more studies will reveal synaptic functions of neurotrophins mediated by p75NTR. Indeed, a recent study has shown that secreted proBDNF, through activation of p75NTR, plays a key role in NMDA receptor-dependent long-term depression (LTD) at hippocampal synapses26. Due to simplicity and easy accessibility, much of our understanding of synapse formation and stabilization derives from studies utilizing the NMJ as a model system27. The formation of neuromuscular synapses can be roughly divided into three stages (Figure 12.2). The first stage is the initial synaptic contact. Axonal growth cones come in contact with the postsynaptic target cells, the myocytes (Figure 12.2A). The second stage is synapse maturation. 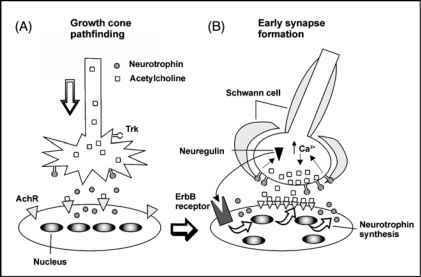 Through cell-cell interaction, the growth cones are differentiated into presynaptic terminals. The quantum secretion machinery gradually matures, and synaptic vesicles become clustered near the presynaptic membranes to form active zones. This process occurs in parallel with the differentiation of postsynaptic myocytes (Figure 12.2B). A hallmark of this stage is the aggregation of acetylcholine receptors (AChRs). The final stage is synapse maintenance, where appropriate synaptic connections are stabilized and incorrect ones are eliminated. Neurotrophins are synthesized and secreted from the muscle cells in an activity-dependent manner28,29. Their cognate receptors, such as TrkB and TrkC, are expressed in the presynaptic spinal neurons and postsynaptic muscle cells28,30-32. Experiments over the last decades have clearly established the role of neurotrophins in the first and second stages. There is also evidence that NT-4 is involved in the maintenance of effective NMJ in the adult32, but whether neurotrophins also play a role in activity-dependent synaptic elimination remains to be investigated. The role of neurotrophins in the first stage of synaptogenesis was examined using the Xenopus nerve-muscle co-cultures. During the earliest stages, exposure to BDNF induces a rapid collapse of growth cones33. The morphology of growth cones changed within minutes following treatment with BDNF. This may be necessary to convert a dynamic growth cone into a differentiated terminal. At the stage where initial synaptic contact occurs, acute application of BDNF or NT-3 elicits a marked potentiation of transmitter release from presynaptic terminals34. It appears that BDNF and NT-3 elicit their acute effects through different intracellular mechanisms. BDNF acts almost exclusively at the presynaptic terminals35, and this effect requires Ca2+ influx36. In contrast, NT-3 is thought to act on the cell body37, and its effect is mediated by Ca2+ from intracellular Ca2+ stores38. Figure 12.2. Outline of Synaptogenesis at the Neuromuscular Junction. (A) The growth cone of a motor neuron approaches a newly formed myotube by recognizing neurotrophin. Near the area of contact, the growth cone of a motor neuron differentiates into a nerve terminal that is specialized for neurotransmitter release. Note that synaptic vesicles in the nerve terminal are not strictly localized at the synaptic sites. Acetylcholine receptors (AChRs) are initially present throughout the myotube surface. (B) As synapses are forming, AChRs are clustered on the postsynaptic membrane and extrasynaptic AChRs are diminishing due to redistribution of AChR proteins and local synthesis of AChRs. The local synthesis results from enhanced transcription of AChR genes by subsynaptic nuclei. Neurotrophins secreted from myotubes enhance transmitter release by increasing [Ca2+]in. Also, Trk signaling upon neurotrophin binding triggers neuregulin expression in the presynaptic neuron and the secreted neuregulin from presynaptic neuron binds to ErbB receptor in the myotubes and increases AChR transcription. Furthermore, increased presynaptic activity induces gene transcription and synthesis of neurotrophins. This positive feedback loop between presynaptic and postsynaptic cells may stabilize the newly synthesized synapse. Much more extensive work has been carried out on the role of neurotrophins in synapse maturation. Two effects have been observed when Xenopus nerve-muscle co-cultures were treated with BDNF or NT3 for a prolonged period of time (e.g., 48 h) after initial synaptic contacts are made. First, electrophysiology experiments demonstrated that chronic exposure to BDNF or NT-3 resulted in more mature and uniformed quanta39-41. Failure rate and variability of impulse-evoked synaptic transmission were decreased. Treatment with NT-3 also increased the excitability of the presynaptic motor neurons42. Second, BDNF or NT-3 also elicited dramatic morphological changes at the presynaptic terminals. Immunohistochemistry and FM dye experiments showed that the number of synaptic varicosities, which reflect clusters of synaptic vesicles, were increased in response to chronic treatment of BDNF and NT-339. Biochemically, BDNF or NT-3 enhanced the expression of synaptic vesicle proteins such as synapsin-I and synaptophysin at the motor nerve terminals39. Synapsins are capable of clustering synaptic vesicles in the presynaptic terminals43. Synapsin I has been shown to promote synapse maturation at the developing NMJ44,45. It is therefore conceivable that neurotrophins promote the structural and functional maturation of the presynaptic motor terminals by the up-regulation of synapsin I.
Endogenous neurotrophins involved in specific aspects of synapse development remain to be established. Different neurotrophins are expressed in muscle cells at different stages of development. The levels of BDNF and NT-3 mRNAs are high in embryonic and neonatal muscle cells but low in those of adult rat32. Moreover, the expression of NT-3 in developing muscle cells is activity dependent28. Membrane depolarization or repetitive electrical stimulation specifically increased the levels of NT-3 mRNA rapidly. NT-3 gene expression was also enhanced by ACh, the neurotransmitter that causes muscle membrane depolarization. Thus, innervation and synaptic transmission at the NMJ enhance postsynaptic NT-3 production. Remarkably, conditioned medium from depolarized myocytes enhanced synaptic transmission at the developing NMJ, and such effect was blocked by the NT-3 scavenger TrkC-IgG28. These results suggest that NT-3 may serve as a retrograde messenger, derived from postsynaptic myocytes to stimulate presynaptic maturation at the NMJ. In the adult, NT-4 is the major neurotrophin expressed in muscle cells. Muscle expression of NT-4 in adult rodent can be regulated by synaptic transmission and muscle activity32. These results raise the possibility that NT-4 is responsible for the effects of exercise and electrical stimulation on neuromuscular performance. In addition to facilitating presynaptic maturation, neurotrophins appear to be involved in the regulation of postsynaptic targets during synaptogenesis by regulating AChR density and/or clustering at the postsynaptic membrane29,46,47. As the muscle becomes innervated, ACh-evoked responses become much larger at the site of innervation and the responses at extrasynaptic regions decline, suggesting the increased numbers of receptors at synaptic sites. Both in vitro and in vivo imaging with a-bungarotoxin (a-Btx) labeling techniques confirmed that AChR clusters become highly localized to the synapses as synaptogenesis proceeds. Nancy and colleagues demonstrated that muscle-derived NT-3 enhances AChR clustering on the myotubes by using co-cultures of NG108 neuroblastoma cells, which express TrkC and C2C12 myotubes transfected with various neurotrophins46. In addition to this in vitro finding, NT-4 knockout mice display enlarged and fragmented NMJs with disassembled postsynaptic AChR clusters in vivo, suggesting muscle derived NT-4 is necessary for the maintenance of postsynaptic AChR clustering48. Interestingly, when TrkB signaling in postnatal muscle cells was disrupted by expressing dominant negative TrkB, AChR clusters on the postsynaptic muscle cells were disassembled in vivo47. These results indicate that NT-4/TrkB signaling is required for the maintenance of AChR clustering in postsynaptic cells. It is still not clear how NT-4/TrkB signaling affects AChR clustering, but growing evidence suggests that NT-4, through TrkB, could possibly activate Fyn kinase, which is implicated in the formation and stability of AChR clusters49-51. Neurotrophins can also modulate postsynaptic development indirectly through the regulation of neuregulin52. 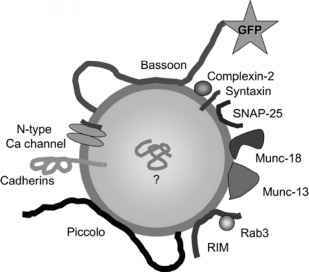 A major function of neuregulin is to stimulate the transcription of the AChR gene in the "synaptic nucleus" of polynucleus myotubes53. Recent data suggest that neurotrophins upregulate neuregulin mRNA expression in the spinal neurons and this in turns increase the number of AChRs at synaptic sites52. In support for this, blocking synaptic activity with curare reduces synaptic neuregulin expression in chick spinal neurons, but neuregulin expression and AChR clustering are restored when exogenous BDNF or NT-3 is added to this nerve-muscle culture52. Taken together, it is clear that neurotrophins modulate synapse formation at NMJ by affecting both presynaptic and postsynaptic sites either directly or indirectly.